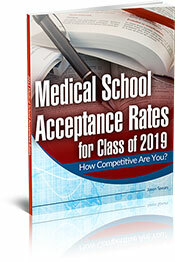 "With Medical School Acceptance Rates Take The Guesswork Out Of Applying By Knowing The Hardest And Easiest Schools To Get Into: Saving You Time And Money By Only Applying Where You Have The Best Chances Of Admission"
If you're concerned about your chances of getting into medical school then this is the perfect answer for you! With Medical School Acceptance Rates you have the medical schools ranked by the hardest and easiest ones to get into. Using this booklet you can apply only to medical schools where you have your best chance of getting in. Now you can makedirect comparisons of each school at a glance because everything is in an easy to read list format. Not all medical schools treat out-of-state applicants the same. It helps to know your chances of admission before applying. You may think a school is a great fit for you, but in reality the school you did not consider may be a better fit...even being the one where you actually get into! Spend your time completing applications and not deciding where to apply. Use Medical School Acceptance Rates to apply to the best schools for you, streamlining your application process. The money you'll save by applying to schools where you are most likely to get in can be used for the secondary application fees. Did you know some schools automatically send you a secondary application even if you have no chance of getting in? Medical School Acceptance Rates pays for itself. Use it to eliminate one wrong school and you save over $60 which is the cost of completing a secondary application. Now is the time to purchase your copy and eliminate any doubts about getting into medical school. Downloads immediately...have the acceptance rates in your hands within seconds and if you're a last minute applicant you already know time is of the essence! If within 12 months, and for any reason whatsoever, you feel Medical School Acceptance Rates didn't benefit you, simply return it and receive a full and courteous refund. No questions asked! "You Just Need to Get In"
Be strategic when applying to medical school and use all the facts at your disposal to become a doctor. Finally, take the guesswork out of applying by learning which are the hardest and easiest schools to get into. It all boils down to saving time and money and giving yourself your best chance of admission to medical school. Imagine starting your first year of medical school with family and friends at your White Coat Ceremony. You deserve to get into medical school! Now there's no reason why you can't know your chances of getting in before you apply. No stone has been left unturned you have all the numbers cut and sliced in every way possible. Immediately after your purchase, you can be on your way to reviewing the hardest and easiest medical schools to get into to improve your chances of admission.